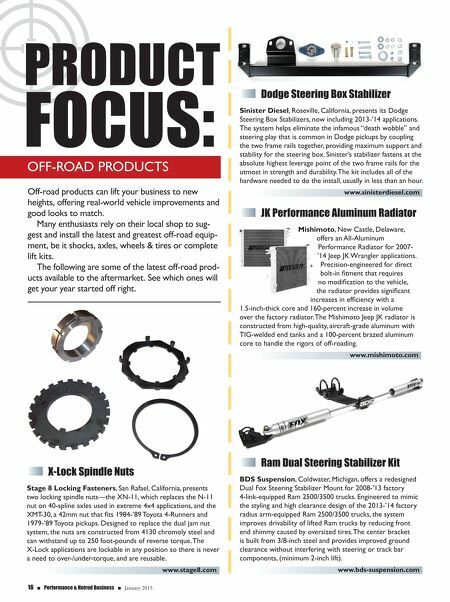 January 2015 n Performance & Hotrod Business n 17 Wrangler Inverted Drag Link Rugged Ridge, Suwanee, Georgia, introduces its new inverted drag link for 2007-'14 Jeep JK Wranglers. Specially designed to fix steering geometry issues that plague lifted Jeeps, the new design reduces bump steer and increases ground clearance; keeping vital steering components out of the way from rocks and other obstacles on the trail. Owners drill out the original steering knuckle mounting hole and relocate the new inverted drag link over the top of the knuckle using a connecting sleeve, gaining ground clearance. www.ruggedridge.com Ford Deep Transmission PML Inc., Inglewood, California, offers a high-quality Deep Transmission Pan, designed to provide increased strength and cooling for 2009-up Ford F-150 and Sport Trac, and 2006-'10 Explorer applications. The pan, which fits some vehicles with the 6R60 transmissions, features a deep sump of three quarts over stock. It clears frame members, uses stock gaskets, and includes a cast aluminum finned case, and oil drain and magnetic plug. www.yourcovers.com Performance Rear Axle Shafts Alloy USA, Suwanee, Georgia, presents its line of heavy-duty rear axle shafts for Jeep, Dodge, Ford, International and GM cars and trucks. The axles are constructed from precision CNC-machined high-strength 4140 chromoly steel and then heat- treated, tempered and induction-hardened. Alloy USA uses the latest cold spline rolling technology, preventing stress points that can lead to fracturing that is common on axles with traditional cut splines. Prior to shipping, each axle is Magnaflux-inspected for irregularities and then coated in a black anodized finish. www.alloyusa.com Billet Aluminum Overflow Canister, 69527 Billet Ring Squaring Tool, 67654 WIRELESS Digital Shift Light, 67006C Spring Tester/Measuring Combo, 66841 ProformParts ProformParts NEW PARTS! Visit ProformParts.com and sign up for a FREE 2015 Catalog!